Michael's mother said his smiles have returned since she started giving him CBD oil. THE MOTHER OF a young boy who has a neurological disorder has written to the Minister for Health to urge him to legalise medicinal cannabis products in Ireland. Noreen O’Neill penned the letter after she tried CBD oil with her son Michael, who is 17-months-old. When she made the decision to try the oil, her son’s doctors had tried ten anticonvulsant drugs to address the his seizures. CBD oil, though not illegal in Ireland, is not authorised as a medicinal product and so it was not considered as a treatment option. Now she has said her little boy has been seizure-free for more than two weeks and she wants the government to open up the healthcare system to these products and include them as treatment options for patients like her son. Last year saw another mother highlighting the potential benefits of cannabis-based treatments in Ireland. Vera Twomey took her fight to the Dáil, requesting access to a product for her daughter Ava, who suffers from a rare form of epilepsy called Dravet’s syndrome. Ava’s condition had been improved by the use of cannabis-based CBD oil and her mother wanted access to a stronger product containing THC, which is not legal in Ireland unless the Minister for Health grants the patient a licence. She was eventually granted a licence to access this drug in November last year. In her letter to Health Minister Simon Harris this week, Noreen O’Neill said her seemingly healthy three-month-old baby had his first seizure in December 2016. He was taken by ambulance to Kerry General Hospital and later transferred to Cork where they spent three months. O’Neill said all of the milestones Michael had reached before his seizures started disappeared in the weeks that followed, “including his smiles, which was soul-destroying”. At his worst he had up to 20 seizures a day. “During those times, a typical day in the hospital would be me waking up to get sick before I did anything else. The thought of what lay ahead and what would become of my baby literally turned my stomach daily,” she explained. I am no stranger to life changing events. I lost both my parents before their time, but this feeling was in a league of its own. Her words made me feel like vomiting. I could literally feel my heartbeat in my throat and pins and needles raking over me. In March last year, Michael left the hospital with a diagnosis of Bilateral Frontal Polymicrogyria, a neurological disorder, and developmental delay. “I was told there was little chance, if any, of ever gaining seizure control, and we couldn’t stay in hospital forever. Home we went, or rather to the house I had to rent near Cork University Hospital, absolutely petrified that I was now solely responsible for Michael with no nurses or doctors outside my door if something went wrong,” his mother said. She said Michael’s seizures were so frequent they became “normal” and none of the drugs his doctors were trying with him were working. In September he had to have a tube put into his nose to be fed through and he became unable to swallow his own saliva. 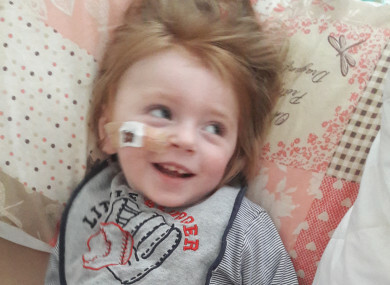 O’Neill was told that while the tube would protect him from inhaling his milk during his feeds, it would not stop his saliva from going into his lungs, which would destroy them “beyond repair, and ultimately end his life”. “I would from then on spend six hours of each day on feeding, with four feeds daily, each taking one and a half hours,” O’Neill wrote in her letter. She did some research on the main drug that Michael was on and after reading a number of personal accounts of loss of the ability swallow, she nudged down his dose and noticed changes in him. When she spoke to his medical team they supported her decision to take him off the drug and try another. This, however, was the 10th drug they tried with Michael and she was told that if this failed they were out of options. In the days after the switch, he had up to 14 seizures a day and was also biting his tongue. O’Neill read about Charlotte’s Web CBD oil, a product that is legal in Ireland, and sourced it at a hemp store. She gave Michael the specified dosage for his body weight and his seizures halved the following day, and halved again the next day. On the third day, she waited for seizures to come, but they did not and they have not since. This was more than two weeks ago. “Yesterday I cooked dinner, uninterrupted, and I was able to sit down and actually eat it. We went for a walk, and I didn’t have to bring the suction machine or cut it short to race back to the house. We watched two Disney movies, to the actual end! I was able to do the hoovering, and not stop at two minute intervals to check him,” she told the Minister in her letter. Speaking to TheJournal.ie, O’Neill said there have been other noticeable changes in 17-month-old Michael other than the lack of seizures. In her letter, she told the minister that her son’s medical care had already cost the HSE almost €26,000 and she believes these costs could have been reduced if treatment with CBD oil was tried earlier on. “What I’m hoping to show to him is what the hemp plant can do in a situation that has been otherwise hopeless – just hopeless. And it would make a difference for doctors to have this as a legitimate option to try, rather than having to start at drug number one and then onto drug number two and number three and number four and all of the side effects,” she said. People Before Profit TD Gino Kenny has written a piece of legislation that would legalise the prescription of medicinal cannabis, but this bill has now been stalled. CBD oil is not psychoactive and is therefore legal and freely available in Ireland. However, it is not authorised as a medicinal product in Ireland and so would not be prescribed by a doctor. Patients can access cannabis products which contain tetrahydrocannabinol (THC), which is psychoactive, if they procure a ministerial licence. Doctors can apply to the Minister for Health for this licence if they believe a course of cannabis treatment is the best option, and if they are prepared to monitor the effects of the treatment over time. These licences have only been granted for four people, including Ava Twomey. In response to a query from TheJournal.ie about Noreen O’Neill’s letter, the Department of Health said “ultimately it is the decision of the clinician, in consultation with their patient, to prescribe or not prescribe a particular treatment, including cannabis-based treatment, for a patient under their care”. The department said Harris is in the process of establishing a ‘Cannabis for Medical Use Access Programme’ to “facilitate access to cannabis-based products, that are not authorised as medicines, but are of a standardised quality and meet an acceptable level of quality assurance”. Severe, refractory (treatment-resistant) epilepsy that has failed to respond to standard anticonvulsant medications. The department said an expert group appointed by the minister has drawn up clinical guidance for healthcare professionals treating patients through the access programme and officials are working on legislation to underpin the programme. Email “'The seizures are gone - his smiles are back': Mother pens letter to Minister after treating son with CBD oil”. Feedback on “'The seizures are gone - his smiles are back': Mother pens letter to Minister after treating son with CBD oil”.